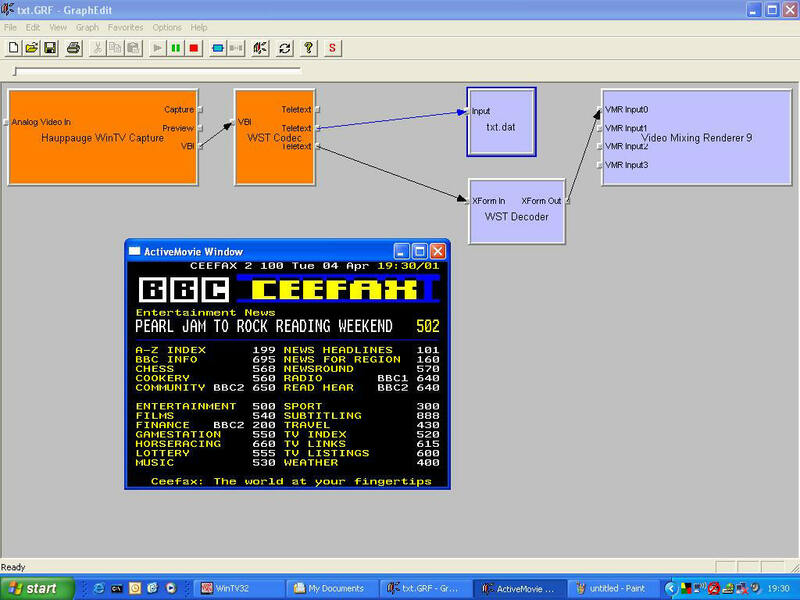 To capture the teletext raw data to disc, I used a custom DirectShow filter. I won't go into all the technical details of how DirectShow works (as I don't know) but using this filter, I was able to capture the necessary data. To capture some data yourself, you will need to download the DirectX SDK. I used the Summer 2004 version as this came with the GraphEdit program you will need to use. After grabbing all the required software, you will need to copy my capture filter to your Windows SYSTEM32 directory and regsvr32 it. Fire up GRAPHEDIT and create a filter graph as shown in my version below. You will probably need to pick a different TV capture filter depending on which TV card you are using. You will find my capture codec called 'dump' under the DirectShow filter branch. You will also need to fire up your TV viewing software and select the teletext channel you want to capture. I use WINTV2000 for this. Once your channel is selected, start the filter running and this will then capture the teletext data to the file you specify when setting the properties of the dump codec. This all sounds a bit complicated and it is so if the above doesn't mean much to you, I should wait until I have written a more user friendly stand alone server program. Please don't ask me how to get it to work with your own brand XYZ TV Capture Card as I wouldn't have a clue ! I have now added a UDP broadcast facility to the dump filter and modifed the BeebEm program to listen for this broadcast. I therefore can now receive live Teletext on BeebEm via my wireless network which is way cool !